Jock Talk with Carlos H. Marquez Jr.
HRRN's Jock Talk show, episode #68. Presented by Tito's Handmade Vodka. 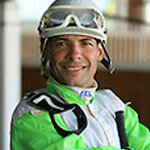 Kristina McManigell spends a full hour with jockey, Carlos H. Marquez Jr.